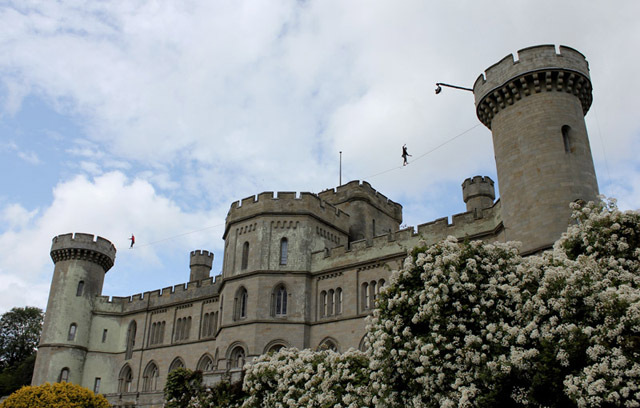 It was a sunny day in mid June and I was in the library revising for my exams when I got a call from Russ at Maverick Slacklines. 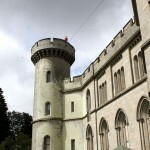 He asked, “did I fancy walking a highline between the turrets of Eastnor Castle“? The stunt was part of the high profile programme, ‘Red or Black?’, Simon Cowell’s latest and most expensive TV production to date. This was the sort of offer that does not come around every day, so without a moment’s hesitation I agreed. The opportunity to be on TV sounded like a laugh, however it was the highline location and stunt that got me really excited. A bit of a one off experience and an opportunity not to be missed. A few weeks later, after a lot of emails and a site visit; this was turning into something really special. This was no ordinary highline (if there is such a thing), this was a race, head-to-head on two symmetrical lines, there and back. 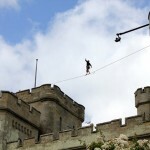 No second attempts, if you fell then you had to get back on and keep going! To add even more tension, there were going to be 130 contestants standing on the grass lawn below, making as much noise as they possibly could having placed their bets, ‘Red or Black’ on either me or the other guy winning the race and helping them get through to the next round, closer to the million pound prize. 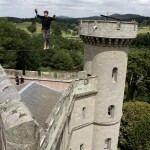 The man I would be racing against was Alun Freem a good friend and my slacklining buddy. 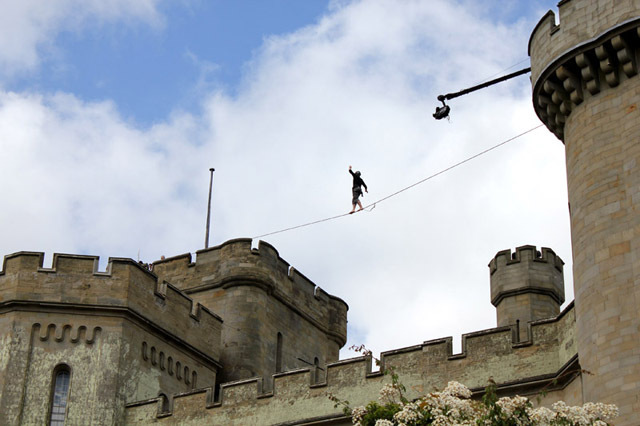 We both comfortably walk 60m long slacklines at low-level so we knew that our technical ability to walk a 20m line up high in the castle turrets would be possible. 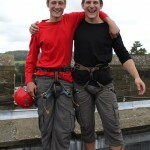 We also do a lot of climbing, so the height shouldn’t have been a problem either. Taking no chances, we spent the couple of weeks in the lead up to the event walking 20m slacklines, high up in the trees to get some practice and were sending these pretty consistently. My confidence felt high, unfortunately this didn’t last for long! This highline was not the same as the other lines I had walked. 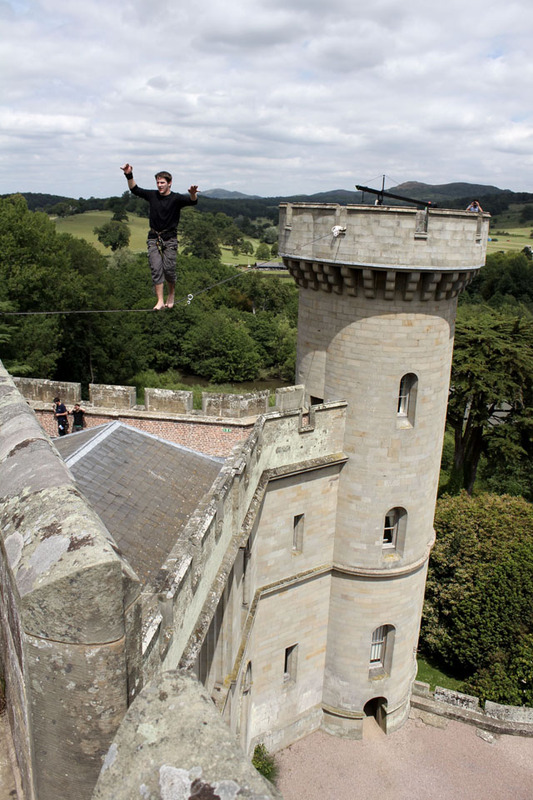 Usually I treat slacklining in quite a selfish way; the only reason I want to send a line is for my own personal satisfaction. 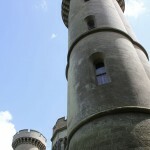 The situation we found ourselves in, on the roof of a 19th century castle, was very different to this. We were working with Maverick on this stunt to do a job, we were there to perform, we had to send these lines on command, not when we felt ready but when the countdown got to zero. 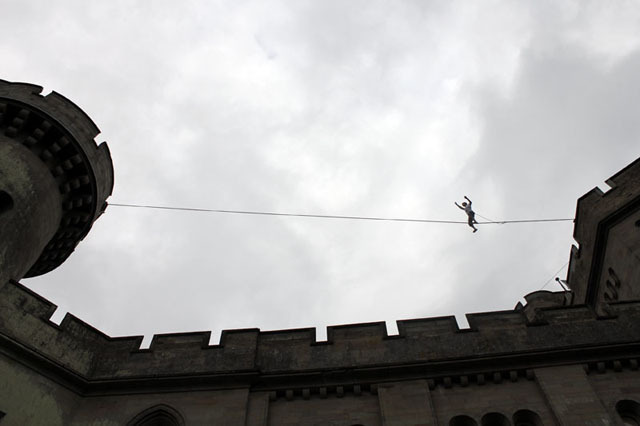 This is not a situation that either of us were used to and took a lot of extra mental preparation to combat the stage fright along with the usual psychological pressures that go with highlining. After two days solid practice Alun was pretty confident and was slowly but surely sending both of the lines on most attempts. The backs of my legs were a nasty shade of purple, with some horrendous bruising from catching the line, but my head was in the right place. I was thinking, we are ready for this, aren’t we?Sunday morning came, and it was time for the race run. I was dressed in black and Alun in red and we both went back to our respective starting towers to get into the right frame of mind for the big walk. The crowd of excited contestants looked up from the lawn below. All bets had been placed, everyone stood a 50/50 chance of winning. Alun and myself had been given the nod from one of the production staff that we would be starting soon so we tied in and got into our starting positions on the edge of the battlements. Before we knew it the madding crowd down below had started a countdown, then an air horn sounded. This was it, we were off. I found my focal point and took a step. The first bit of the line by the anchor is always the worst. 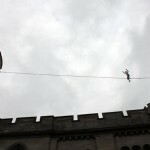 I tried to move quickly to get away from the edge and get into the more mellow middle of the line. For a split second my focus faltered and I lost it, I was falling. I was past the point of no return and caught the line on the way down. This was the first time the noise of the crowd penetrated my concentration as they all let out a huge gasp. There were going to be no second attempts, I knew I had to get back on. I swung a leg back over the line and got comfortable in a sitting position and rocked back up to stand. The crowd went wild, I had to keep focused and get this thing finished. 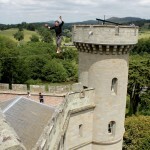 I was so relieved when I set foot on the battlements at the halfway point. No time to waste, I had to catch up. I spent a few seconds faffing about with a key on a lanyard that we had to collect before getting straight back on the line. This second leg was my preferred direction to travel on the line, I was confident and knew I had the speed to catch up but lagging behind. I raced furiously towards the finish line and got within 6 feet from the end of the line when I heard the crowd go wild, Alun must have reached the end of his line. I knew the race wasn’t over until he had unlocked a flag from a box and waved it, I ran the last few feet of the line, there was nothing to lose now. After all of that, the fall, climbing back on, fumbling the key at the mid point there was only a couple of seconds in it. Alun took a well deserved victory. Well done mate, I nearly caught you. After a celebratory flag wave from Alun I breathed a sigh of relief, just so pleased to have been part of this amazing feat. 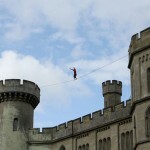 Eastnor Castle highline: well and truly sent. Q – How long they have been doing it, what training have they had? 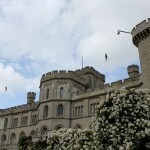 Q – Was Eastnor one of the most challenging walks you’ve ever done? If not what has been the most challenging? Lengthwise Eastnor one was as hard as any I tried previously. What was different was the psychological aspect of handling stage fright when performing in front of a huge crowd! 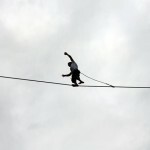 I don’t see slacklining as dangerous – as long as you have rigged you lines correctly and you know what you are doing. Q – Do you get nervous before each challenge and were you more nervous because you were competing for the contestants? I was more nervous because contestants were there watching! If I was winning the money I think this would have made a difference to how nervous I was! The unknown factor made it more challenging. 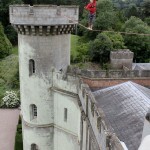 Q – What precautions did you take at before completing the challenge Eastnor? We just took the usual extra precautions for highlining - Maverick provided us with the kit we needed and we had a professional rigger as well. 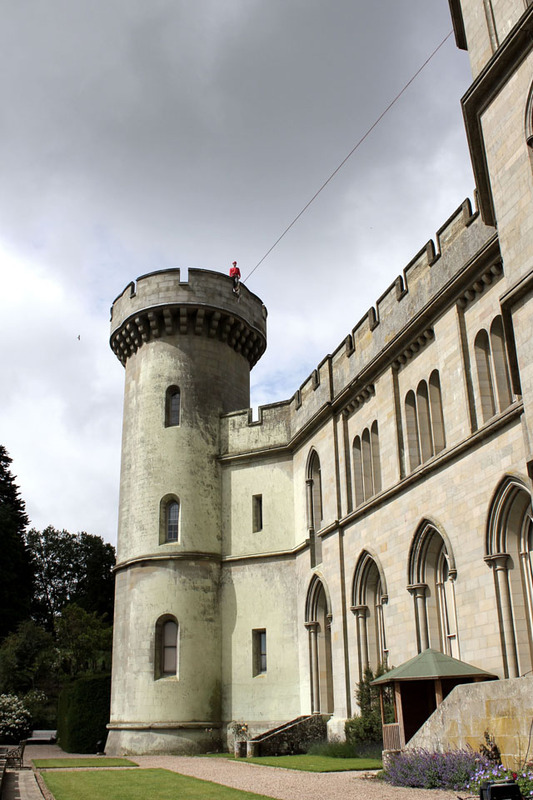 Q – What preparations did you take before completing the walk at Eastnor? What were you thinking about whilst completing the walk? Beforehand the guys at Maverick had told us how long the line was and so we rigged same length line up high in trees close to home to practice. When you are on the line, your mind is empty apart from the next step every bit of focus and concentration is just about that next step. Q – Are you competitive? 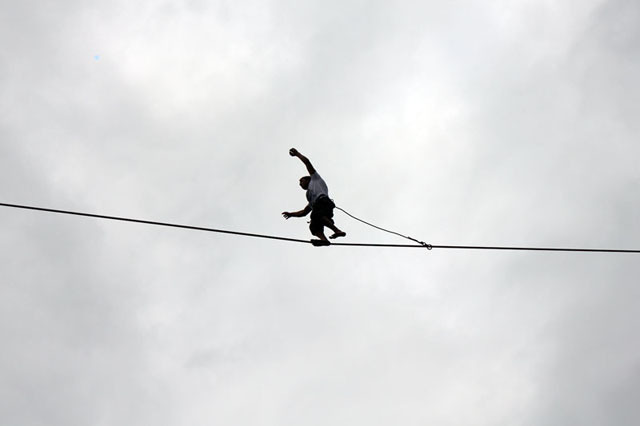 Q – Sportmen are known for their rituals before a big game, did you perform any rituals before each slackline? 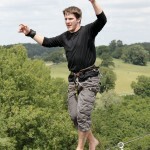 Q – Is there one place they would love to slackline and if so where would that be and why? Lost Arrow Spire Yosemite; it’s about the same length of line, but 10,000 feet up – it’s an iconic place in the history of slacklining. 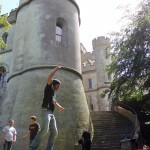 Q – Where is the strangest place they’ve ever slacklined? Can’t think of anywhere strange – lots of interesting places though. Q – How long they have you been doing it, what training have you had? 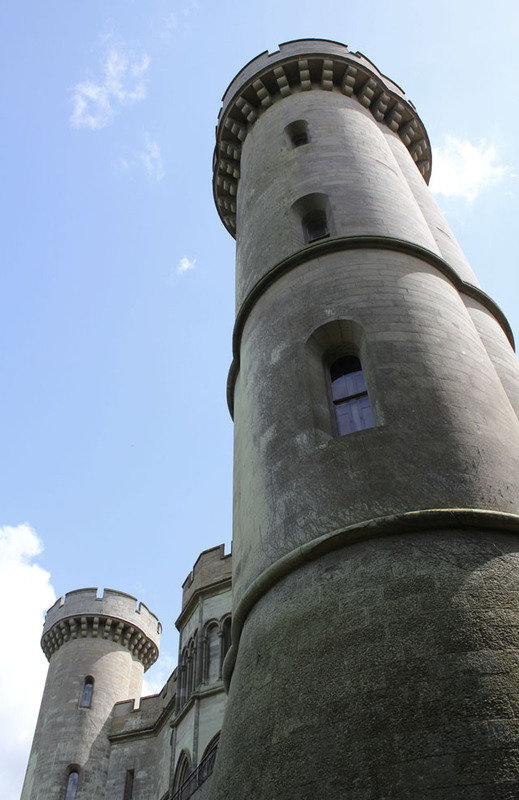 Q – Was Eastnor Castle one of the most challenging walks you’ve done? If not what has been the most challenging? 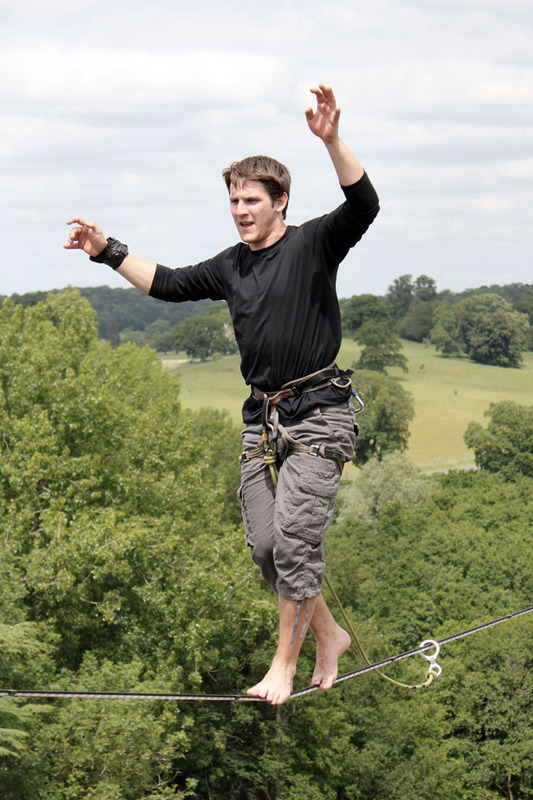 Yes partly because it was the highest and longest Highline I had walked to that point but mainly because of the additional unknown factor with the crowd – performing is something I was new to, normally I slackline in a small group or by myself in natural settings. 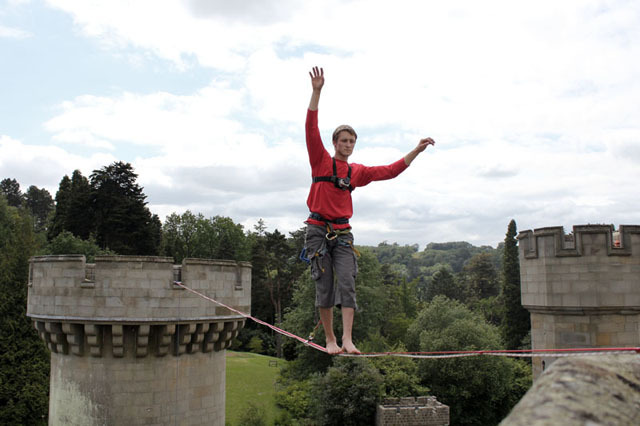 Q – How dangerous is slacklining? Q – Did you get nervous before each challenge and were you more nervous as you were competing for the contestants? 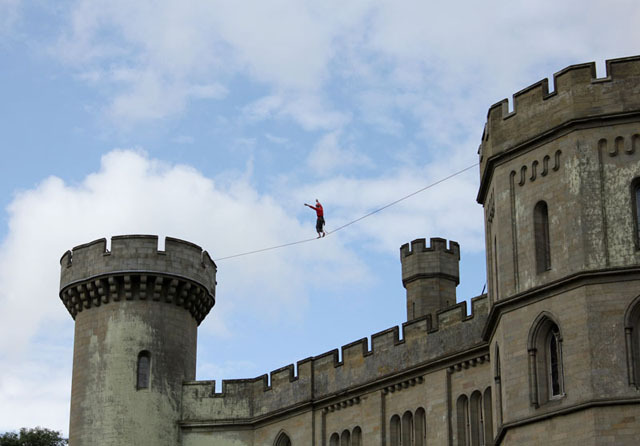 Slightly more excited about the challenge than nervous, I felt it was more important to concentrate on walking the line than in the competitors as walking the line requires a high level of concentration. At first I thought the crowd would be distracting but once I got used to it on the walk back I found them quite encouraging. 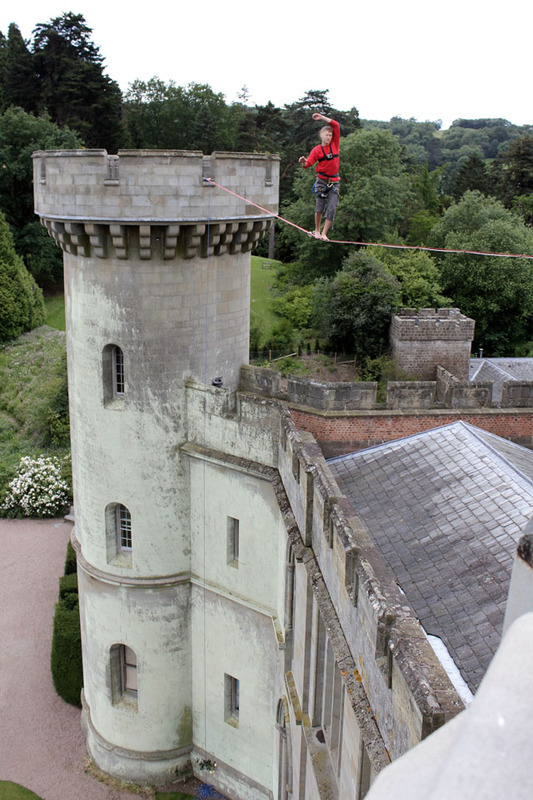 Q – Were there any extra precautions you had to take at before completing the challenge Eastnor? The main extra precautions/difference to a normal Highline involved working with a team of professional riggers who were great - they made the anchor points for our slack line and helped rig/tension the line, and mentally preparing myself for a walk in front of hundreds of people, some of whom had money riding on me. 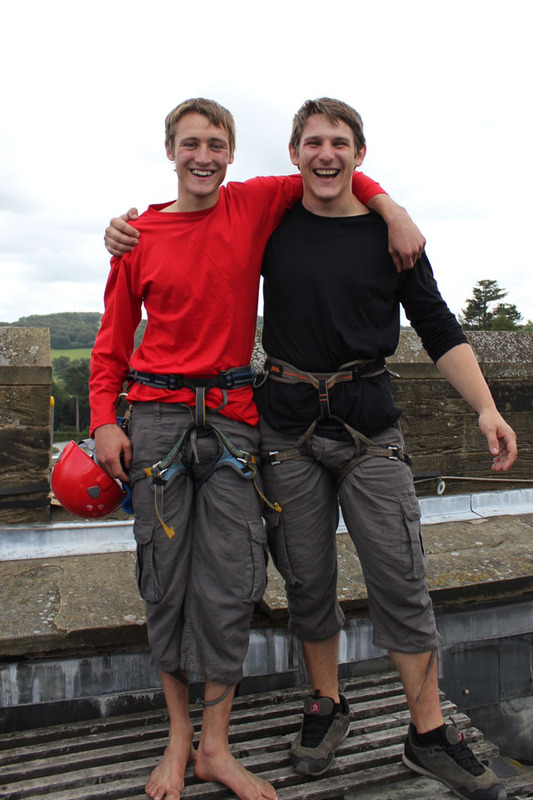 Q – What preparations did you take before they completed the walk at Eastnor? What were thinking about whilst completing the walk? 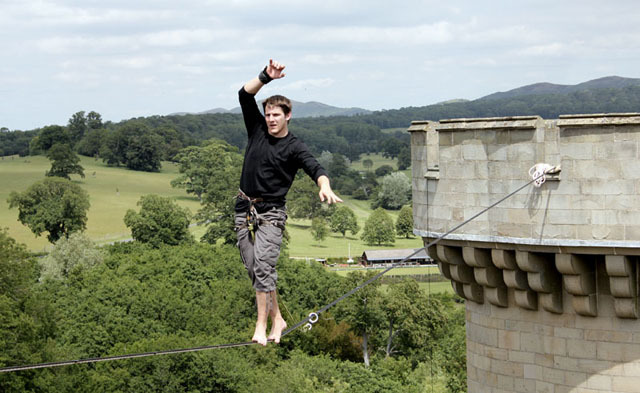 Q – Sportsmen are known for their rituals before a big game, do you perform any rituals before each slackline? 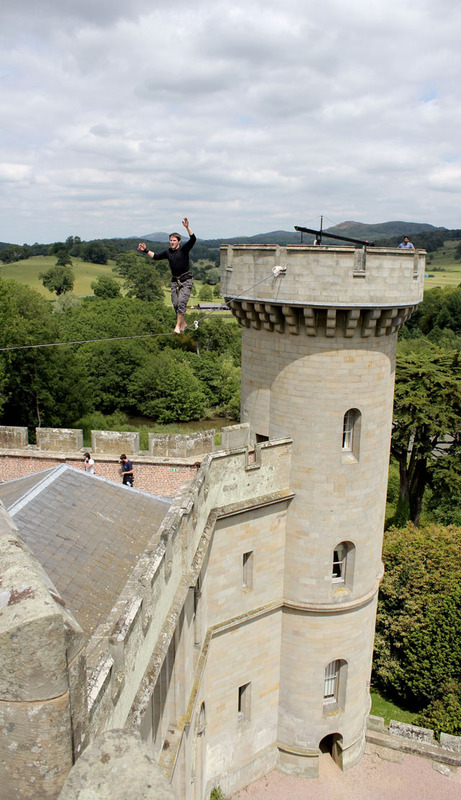 Q – Is there one place you would love to slackline and if so where would that be and why? 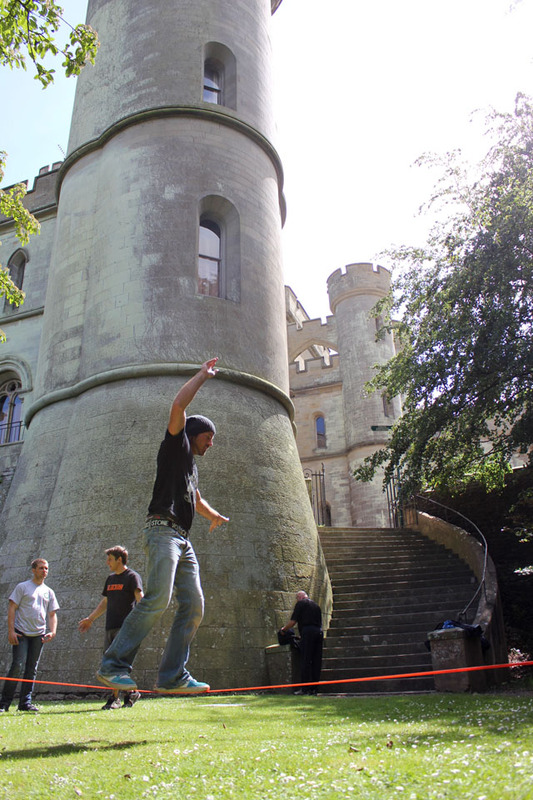 Q – Where is the strangest place you have ever slacklined?